dsjv :: Deep South Jewish Voice: Israel File :: Will Olmert's Goodwill Gestures Be Enough To Kick-Start Peace? Israel File :: Will Olmert's Goodwill Gestures Be Enough To Kick-Start Peace? 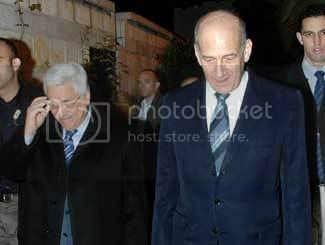 Ehud Olmert, right, welcomes Mahmoud Abbas to his official residence Dec. 23 in Jerusalem. JERUSALEM, Dec. 25 (JTA) — After the plethora of goodwill gestures Israeli Prime Minister Ehud Olmert made in his meeting Saturday with Palestinian Authority President Mahmoud Abbas, politicians and pundits on both sides are asking one question: Will it be enough to kick-start the stalled Israeli-Palestinian peace process? Leaders on both sides are optimistic. They see Olmert’s moves as part of a new and wider American plan for Israeli-Palestinian accommodation. Pundits, however, are downbeat. Few believe Abbas will be able to create the necessary conditions on the Palestinian side for successful negotiations with Israel. The meeting was the first between the two leaders since Olmert’s election victory last March. Its primary purpose was to help strengthen Abbas and his relatively moderate Fatah movement in their ongoing power struggle with the radical Hamas. Olmert’s moves were part of a two-pronged plan: To show the Palestinian people that more can be achieved through Abbas-style dialogue with Israel than armed confrontation, and to strengthen Fatah militarily by allowing it the wherewithal to build its armed forces ahead of a possible showdown with Hamas over approaches to Israel. • Israel would release $100 million in frozen Palestinian tax money. • It would remove dozens of checkpoints to facilitate Palestinian movement in the West Bank. • It would ease passage in and out of Gaza to enable the free flow of goods and medicines. • It would consider freeing a few dozen Palestinian prisoners in early January to mark Id el-Adha, the Muslim feast of the sacrifice, ahead of the release of Cpl. Gilad Shalit, the Israeli soldier held by Hamas-affiliated militiamen. • It would agree to set up joint committees to consider further prisoner releases and the removal of key Fatah operatives from Israel’s wanted list. • It would allow Egypt to supply Fatah with 1,900 Kalashnikov rifles. • It would allow the Palestinian Badr Brigade, currently stationed in Jordan, to redeploy in Gaza. Olmert went out of his way to show friendship and respect for Abbas and his presidency, waiting for Abbas outside the prime minister’s residence and embracing him warmly on arrival. Olmert also made a major symbolic gesture: For the first time, Palestinian flags were flown in an official Israeli state building. “Abu Mazen is an adversary — he is a not an easy adversary, but with an adversary like this, there is, perhaps, a chance of dialogue that will bring an accord between us and the Palestinians,” Olmert said in a speech Sunday, his first public comments following the two hours of talks with Abbas. Senior Abbas aide Saeb Erekat also was cautiously optimistic. “It would be a mistake to think that all the problems could be solved in one meeting, but the meeting improved the feeling on both sides,” he said. Writing in the mass circulation daily Yediot Achronot, political analyst Itamar Eichner summed up the new friendship between Olmert and Abbas. “They have a common interest not to mention a common enemy: to block the rise of Hamas, which enjoys massive support from Iran,” he wrote. The Israeli moves complement U.S. and European efforts to strengthen Fatah. The Americans are soon expected to release about $100 million to Abbas, and they also have been training Fatah forces. British Prime Minister Tony Blair, in a mid-December visit to Ramallah, outlined economic projects from which the Palestinians could benefit if they reached accommodation with Israel. All of these moves are part of a wider plan for Israeli-Palestinian peace talks that has begun to take shape in the U.S. State Department. The new American thinking envisages leapfrogging stage one of the internationally approved “road map” for Israeli-Palestinian peace and moving directly to stage two, which calls for the establishment of an interim Palestinian state with provisional borders. Discarding stage one means that talks could go ahead without the Palestinians first stopping all violence and without Israel dismantling illegal West Bank outposts. The idea is that once a mini-state is established, those things would be much easier for the parties to handle. By strengthening Abbas, the Americans hope to create conditions for the establishment of a new Palestinian government that would recognize Israel and become a serious negotiating partner. U.S. Secretary of State Condoleezza Rice is expected to make a visit to the region soon to press the plan. The American approach is not much different from ideas being bandied about in the Israeli Foreign Ministry and supported by Foreign Minister Tzipi Livni. Livni, who favors going directly for an interim Palestinian state, told a meeting of Europe-based Israeli ambassadors in Jerusalem on Sunday that the Olmert-Abbas meeting was important not as “a lone gesture, but as a process of which gestures are a part.” She added that in her view, moderate Arab and Muslim states should be involved as well. On the Palestinian side, Abbas also expressed the hope that the meeting would lead to peace talks. Israeli pundits, however, are skeptical. They doubt Abbas will be able to carry off the necessary first step: the establishment of a Palestinian government that makes the right noises about recognizing Israel, accepting previous Israeli-Palestinian agreements and renouncing violence. “First that must happen, but as we know from experience, something on the way is bound to go wrong, and all we’ll get is more of the same,” political analyst Ben Caspit wrote in the Ma’ariv daily. “Many meetings between Palestinian and Israeli leaders have taken place up till now, but it seems that never have two such weak partners sat on either side of the table — Abu Mazen on the verge of a civil war and Olmert after a war and embroiled in an investigation,” Caspit wrote. The trouble is, Palestinian society is deeply divided over how to proceed. In Abbas’ view, the Palestinians will always be outgunned and therefore will lose in any violent confrontation with Israel. Thus, negotiation is the way forward. Hamas holds that time is on the Palestinians’ side, and the best path is to establish a temporary truce, use it to stockpile weapons and wait for Iran to become the dominant regional power. Israeli intelligence estimates that if Abbas is able to rekindle a peace process, Hamas will escalate its violence against Israel in a bid to extinguish it. Complicating matters even further, the fight on the Palestinian street is not only between Fatah and Hamas. Poverty and the breakdown of law and order have spawned violent, armed gangs loyal only to themselves and contemptuous of authority, whether from Fatah or Hamas. They will probably continue to use terror against Israel, even if Abbas and Hamas agree to a cease-fire. If the latest American initiative is to succeed, it will have to find a way of neutralizing both Hamas and the street gangs. Otherwise, new peace prospects will drown in a sea of Palestinian chaos. Making peace at the best of times would not be easy. In these circumstances, it will be a very tall order indeed. JTA correspondent Dan Baron in Jerusalem contributed to this report.